In the quiet hours of dawn, on the morning of 6th March, 2013, five classical dancers entered the Chidambaram temple, one of the five holiest Shiva temples representing the classical element of Akasha ~ ether. We silently walked toward the main Sanctum Sanctorium. There, a silken curtain veiled the sacred idol of Lord Nataraja. Behind this veil, the priests were readying the God, for the early morning Abhishekam ~ the most elaborate puja of the morning. Praying inwardly with excitement and nervousness, I stood at the edge of the still, shimmering curtain. At the auspicious hour, the veil dropped, and lo and behold, these eyes fell upon the resplendent image of Lord Shiva, in the pose as Nataraja, performing the Ananda Tandava, “Dance of Delight”! The brass temple bells chimed all over Chidambaram in synchronicity, as the gathered bhaktas ~ devotees, joyfully participated in the magnificent pooja. We were asked to place our brass anklets upon a large brass plate by the temple head priest. This plate was then kept at the feet of Lord Nataraja. Our names and our Nakshatram ~ birth star, were spoken aloud in prayer by the priest, a unique tradition in Southern India, when receiving the blessing from the Lord. At the end of the pooja, our brass anklets were returned to us. We were felicitated by the head priest of this ancient temple with a silken shawl, also garlanded with a densely woven, yet light weight, fragrant grass called Vettiver ~ Khus, dear to Lord Shiva. After a pradakshina ~ circuambulating the temple, we sat down for Homan ritual, making offerings into a consecrated fire with the temple priest. He chanted mantras for the well-being of the dancers, and once again each of our name, and nakshatram was pronounced into the fire, for blessings. The morning ritual was complete just before the first Maha-arati, a prayer for the Lord. We were led to the platform opposite the main sanctum of Lord Nataraja. The senior-most amongst us, Dancer Malavika Sarukkai, was invited first to offer her dance to the Lord, followed by the four of us. Four dancers, before me, sanctified the temple space through their dances with an accompanying live orchestra. I was the final one to offer my dance. An archival recording of musical compositions sung by Shri M. S. Ramdas & Shri Ramiah Pillai, from the T. Balasaraswati tradition, was handed to me by my teacher, Smt Shyamala, who had initiated me into their tradition, only two months earlier, at the Kamakshi Amman Temple in Kanchipuram. Shyamala Akka had also surprised me by arriving all the way from Chennai, moments before my dance offering to the Lord. It was my first public performance in this tradition. I felt blessed with the unexpected presence of my teacher, whose wise words of blessing still remain etched in my being. She reminded me that my offering of dance to Lord Nataraja of Chidambaram was a kind of a spiritual test of presence and single-minded devotion. The ego will be challenged. I may experience trepidition and an inward struggle. Yet, it will also be a direct experience of feeling the powerful and compassionate presence of the Lord of dance. And this is precisely what unfolded. 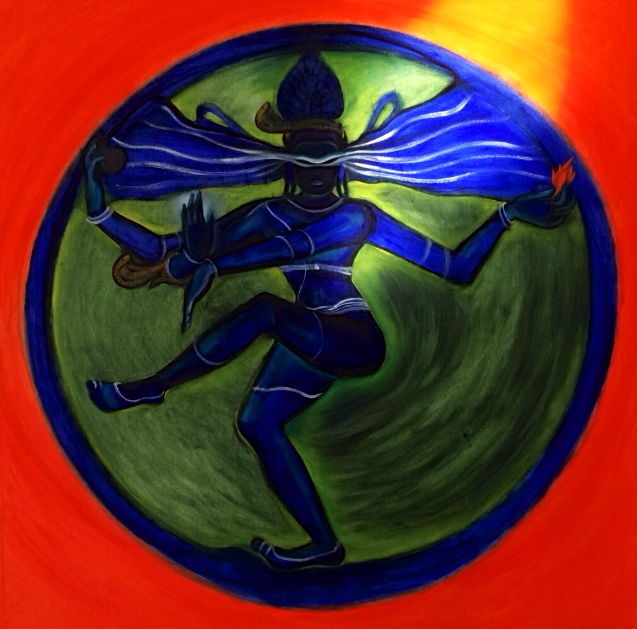 I began my dance with the Alarippu, with the awareness that through this opening dance, I journey inward. As I struggled to unlearn my habit body to charm the gathered audience, my being suddenly dropped into an inward prayer. The space within softened. The breathing calmed. This body trembled with life and vitality. The lilting alaapana of Khamas ragam, prepared me for the chosen Padam, ‘Theruvil Varano’, which is a devotional song about a Nayika, who stands at her gate, watching the festive temple procession of Lord Shiva, going past her home. The refrain in this song to Lord Shiva is, “ Will you not turn back and give me a fleeting glance, O beloved Chidambaram Natham~Lord?”. I stood still with a beating heart, eyes closed. Moved by the raga, these eyelids looked up slowly, and saw Lord Natraja standing right ahead of me. Enveloped in his resplendent presence, this throat choked up with emotion, tears welled up inside bhakti, the crowds disappeared, the gait calmed down, the sound of my anklets merged with the voices of my accompanying musicians, transporting us all into eternity. In William Blake’s words, ‘To see a world in a grain of sand and heaven in a wild flower, hold infinity in the palms of your hand and eternity in an hour’. I felt the Lords presence. I recognised my destiny. I was humbled. Drowning into a blissful state of gratitude, tears cleansing a hidden past, once hindered, blocked, repressed, but not anymore, I heard a voice say. Today, like a Phoenix rising from the ashes, these wings soar towards light of love, unhindered, unafraid and adorned in happiness!